I sleep horrible. I am not 100 % used to sleep in the outdoors, there is a stream near by that makes noice and potentially aggressive deer can be spotted, they circle around my camp. The spot I chose yesterday isn’t flat and I try to sleep with my head deeper than my legs. I use a short Therm-a-rest sleeping bag but I can’t level out the surface. In the morning I pack up the camp quickly – I don’t want discussions with rangers. Again, I pack out more trash then I brought in and I sleep in a well established camp site. The trail is wet, something you learn to love after only three days on dusty trails. It will be like this until Mammoth but I didn’t know this then. And the trail is wet just for ten minutes. I will enter the Glacier peak wilderness but before I have to do this huge tourist highway. Tons of hikers, NOBOS are common. All day hikers have their bear spray ready but there is no bear in sight. Apparently there are even Grizzlies here – according to Wikipedia approximately twenty. Groups of young girls with their leaders, in front and on the back, every one of them with a huge pack, their tents in the stuff sacks and a lot of pots and pans. Obviously with a pack like this and the heat, you can’t enjoy it. They will hate backpacking later and they will have to learn that there is a method called UL. Some look like short before fainting. I even see rangers. They ask me if I am PCT. When I say yes they tell me I am good to go. Older men have hand operated pumps just to get water out of streams. They carefully remove their shoes and socks before streams. I just step in. My shoes have a massive upper. No waterproofing but they stay wet for a longer time than Altras or Hokas and they get hot afterwards. I wash my feet in a massive stream to cool them down. Soon afterwards I reach a ranger station at high bridge (more pictures here), where I could go to Stehekin. 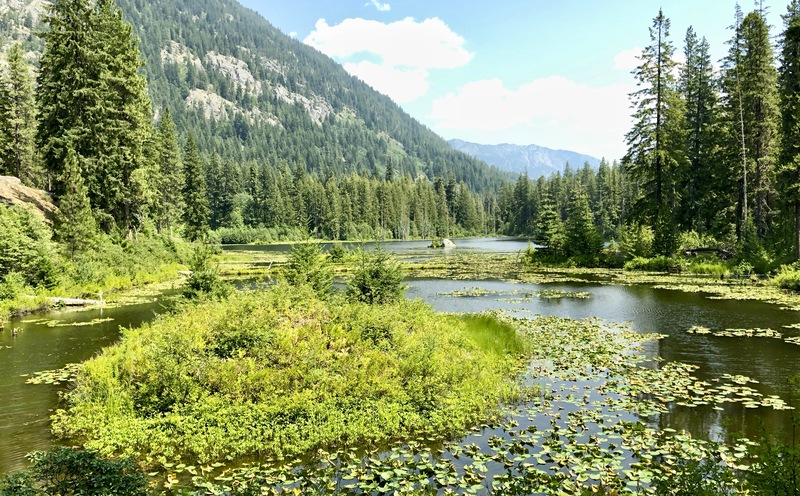 I don’t go to Stehekin since I want to save up this town experience for the coming years. I heard from the bakery but I am afraid, that I would be in for a disappointment anyways. It is hard to come by good pastry in the US, but not really in Zurich. There are several bakeries, usually just around the corner in Zurich. If you have some cash, everything is possible. I guess the bakery in Stehekin is extraordinary for the US, for spoiled Europeans it may not be. But I would love to learn the opposite when I will visit Stehekin in the future. Of course I don’t eat enough and I make it to Cedar Creek camp, where others are already installed. I see a survival guy who sleeps just in bivi with clothes on. Before I pass another camp site where I spot Mr Airborne. He is extremely thin. Later I learn from IG that he does fine.